This post is to inform people how to use the report function here on SpoilerTV. 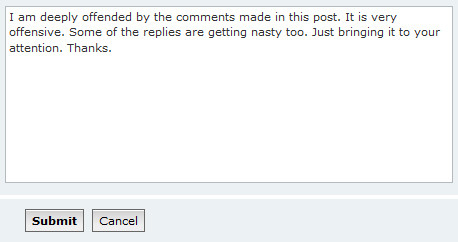 This is a feature on the forums that allows users to alert Moderators about an inappropriate post. When should I use the report function? Anytime you think a post needs moderation, for any reason at all, report it. The Moderators will then be alerted to it, and will handle the situation. If a thread is starting to get argumentative, just report it instead of fighting back. The situation will end better if you do this. Press the "!" Exclamation Point Button on the upper right hand side of the post you wish to report. There are 3 steps to this. 1. Reason: Select the reason that best describes why you are reporting this post. 2. Notify: If you wish to be emailed when the report has been taken care of, select "Yes" if not, then make sure "No" is selected. 3. Further Information: This is where you can explain the specifics of why you reported it. This is the most important part, as it gives Moderators the information they need to handle the situation. When reporting, make sure you fill this part out. After that, finish by pressing the "Submit" button at the bottom. A Moderator will then get to it ASAP and handle the situation. If you have issues doing this, please make a post in the Help Section. Thank you.